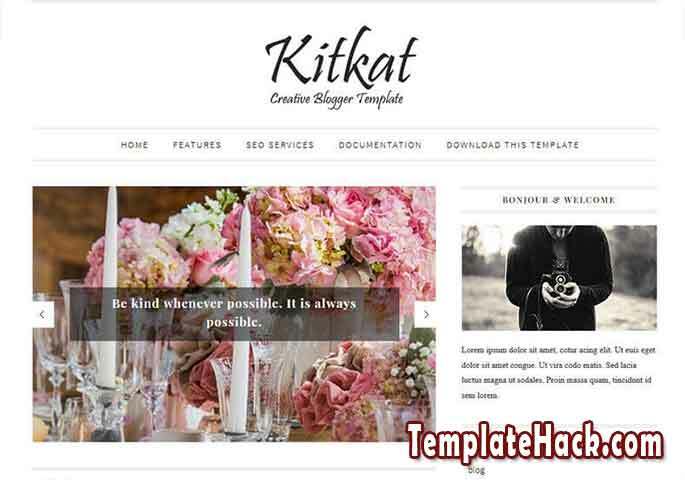 TemplateHack.com - Download KitKat Minimalist premium blogger template. Kitkat is fashion style blogspot template. This template is adapted from Wordpress Theme, because that, KitKat has a great professional design. This template has slider and slideshow features to make your blog look like professional website. To get this free premium blogger template, click the download button and skip the ads there. If you will see the demo version first, click the demo button below. About Me, Breadcrumbs, Browser Compatibility, Drop Down Menu, Email Subscription Widget Ready, Featured Post, Girly, High CTR, Instagram Ready, Mobile Friendly, Photo Profile, Post Thumbnails, Search Box Button, SEO Friendly, Social Share Button, Stylish, Whatsapp Sharing Button, Whatsapp Sharing Button, Clean, Elegant, Minimalist, 1 Right Sidebar, Black, Dark, Grey, White, 2 Columns, 3 Columns Footer. Adapted From Wordpress blogger template, Beauty blogger template, Entertainment blogger template, Fashion blogger template, Film blogger template, Health blogger template, Lifestyle blogger template, Magazine blogger template, OOTD blogger template, Personal blogger template, Photo blogger template, Photography blogger template, Portal blogger template, Reviews blogger template, Travel blogger template, Viral blogger template, Wordpress Look blogger template.